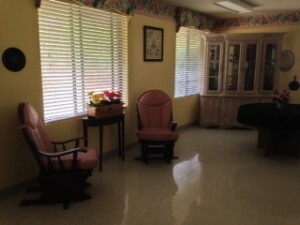 Facility has private and semi-private rooms. 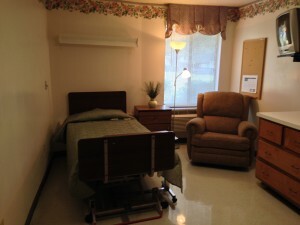 We also have rooms designated for short-term rehabilitation (shown above). We encourage our residents and families to decorate the rooms with items from home to ease the transition from home to nursing home. Wi-Fi is available for residents and rooms are wired for cable television. 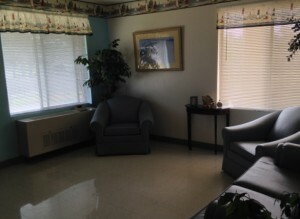 The facility has several sitting areas for residents to relax in or visit with friends and family. Each room has its own unique decorative theme. Residents enjoy our garden areas as weather permits. Smoking is permitted in designated areas. Dining options for our residents include a wide variety of therapeutic diets to meet everyone’s nutritional needs, including restorative dining. We offer snacks throughout the day and upon request. Our Dietary staff takes pride in the preparation of each meal. Our facility provides and encourages our residents to actively participate in activities functions such as games, music, religious services as desired, and entertainment. This encourages socialization and a sense of community for our residents. Our Activity Director assures that every day is a day to look forward to.